It’s about time I posted a new recipe. Here’s one I came up with tonight because we had a surplus of eggs and okra from our local farmer’s market this week. Cut up okra into 1 inch or longer slices. I left the smallest ones whole (after cutting off the tops. Chop onion and garlic. Sauté onion and garlic in skillet with 2 Tbs of oil. Add okra once the oil is hot and continue to sauté for several minutes. Cut yellow squash into thin pieces by slicing lengthwise and then turning 1/4 turn and slicing lengthwize again into thin strips. Cut these into 1 inch pieces, about the same size as the okra. Dice the poblano into medium pieces. Mix pepper and squash into the okra and continue to sauté. Add chana masala (or an Indian curry with cumin, garam masala, etc.) and coriander chutney or (other green Indian chili mix with coriander/cilantro, mint, green chili). Keep sautéing and stirring occasionally. Mix 6 eggs and 1/3-1/2 C buttermilk in a bowl until well combined. 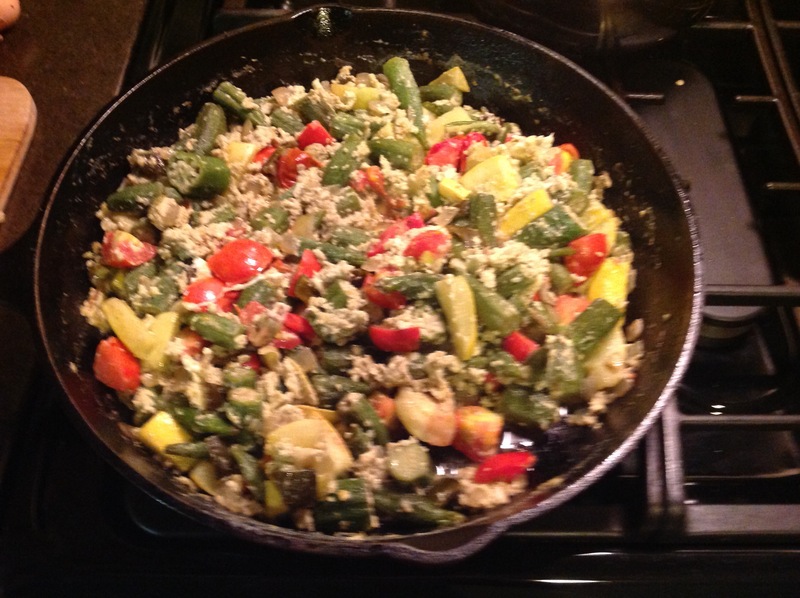 Pour into the okra mixture and let scramble, stirring occasionally. Add tomatoes once the eggs are nearly set. Sauté until most of the liquid has boiled away. If you like Indian spices, this combination is very good. If not, you could easily substitute any savory spices that go well with eggs.